The UN organizational chart refers to the organizational structure of the United Nations, which is an international institution established in 1945 by over 50 nations. The member countries of the UN aim to maintain worldwide security, strengthen human rights, improve national-level relations and living standards. Now you can see more details of the UN organizational chart by clicking on the below diagram. This part of the UN organizational chart now has over 180 countries with the common aim of developing global monetary cooperation and improving international trade so as to benefit global economic growth. Some other important duties of the organization are to maintain international exchange stability, assist in building the lateral system of payments, and assist member countries in dealing with their balance of payments. WTO is the only international institution that was established to deal with trade between countries. The key aim of WTO is to improve the global business relations between member countries. Normally, member countries cooperate based on WTO agreements, negotiate or sign paper-documents for their products. There are some specialized agencies listed in the UN organizational chart. These sub-divisions are legally independent international institutions with specific rules as well as financial assets. Some of the specialized agencies have a history of over 100 years, while others were established at the same time with the United Nations. Basically, these agencies cooperate with each other at both the intergovernmental level and the inter-secretariat level. 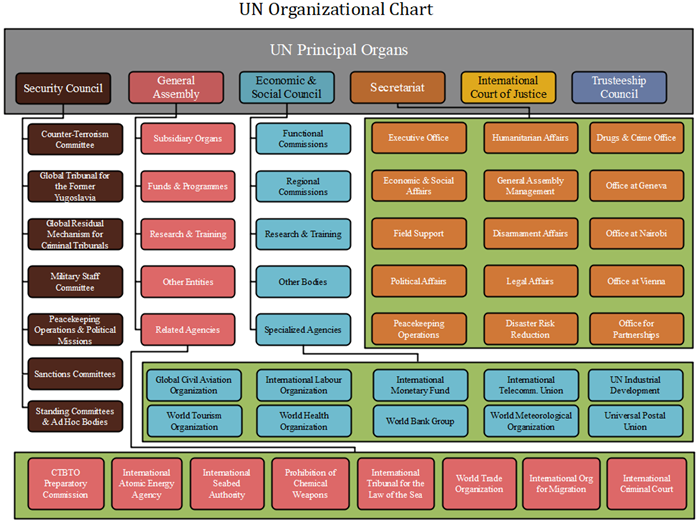 These organizations in the UN organizational chart are similar to Specialized Agencies in terms of daily functions. Generally, the Related Organizations reports important issues to the Security Council or the General Assembly. Moreover, the General Assembly also in charges of the Peacebuilding Commission and the High-level Political Forum on Sustainable Development (HLPF). How Could I Draw the UN Organizational Chart Like This? Easy, just go to the org chart creator guide for a quick start for more org chart design resources without professional drawing skills. Alternatively, feel free to use this easy org chart creator for more advanced settings and management of your business teams.